Earlier this week, OnePlus confirmed that it's going to unveil a brand new smartphone on October 12. The handset should be called OnePlus X, and, although OnePlus hasn't officially showcased it yet, it seems that we already have the chance to check it out, thanks to the FCC. The Federal Communications Commission recently approved an unannounced OnePlus smartphone listed as the "One E1005," also posting two photos of it. While the photos are far from being the best we've seen, this is certainly a device that was not revealed before. 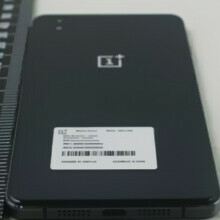 We can see the OnePlus logo on the back of the handset, plus what appear to be a camera and an LED flash. A microUSB port and dual speakers are included at the bottom of the phone, while the front side has a simple design. According to the details found at the FCC, the One E1005 is powered by a processor clocked at 1.9 GHz, further featuring LTE, Wi-Fi, GPS, Bluetooth 4.0, and a 2450 mAh battery. Apparently, the new smartphone is 139 mm tall - which means its screen likely measures around 5 inches (this is the rumored dimension of the display on the OnePls X). Of course, the new device revealed by the FCC might not be the OnePlus X after all. Previous rumors had it that OnePlus could also release a OnePlus Mini at some point. Or maybe the OnePlus Mini is the OnePlus X? We'll see what happens on October 12. Agree. If they could keep the same Specs but making 5" it would be a winner. Since we do have people that want a 5" inch oneplus one/two. A bigger iPhone 5... :| That's what I thought.. The size sounds good but that battery capacity seems worrisome. Looks like crap. Looks too much like a stupid iPhone. I'm disappointed in their lack of creativity, I love the design of my OnePlus One. Too bad they didn't just stick with that design. 5" is not mini enough. Only 0.5" difference. Should've been 4.7" at most. Idk.. Which the average size of phones moving to 5.5" I believe 5" is an appropriate mini... 5" just so happens to also be my sweet spot.. But like others said above I'm so disappointed how .5" can bring a phone from flagship to midrange... Why? Project Ara can't come soon enough. Still has a poor camera, poor display and poor battery life? Why not just get a prepaid junk phone for $99? Could be the new 620 processor. And definitely like an iPhone 4 reloaded; oneplus style. Op. Op. Op. Doesnt seem like the revolutionary design that Oneplus CEO was talking about, mentioning he wasn't sure if he'd choose the Oneplus X or the 2 for his dailydriver..